Our Amish handcrafted gun cabinet is the perfect place to store all your hunting guns and accessories. This is a dream gun cabinet for the serious hunter. 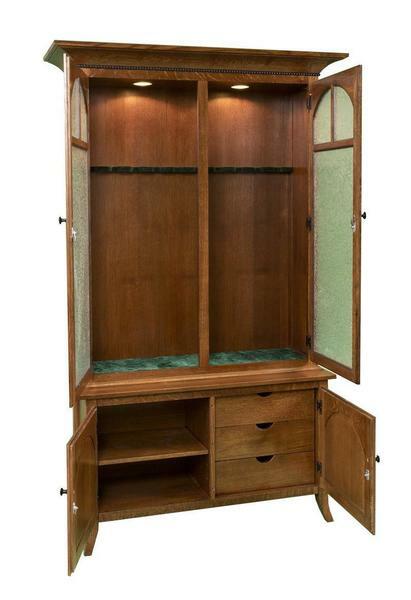 Standard features of this solid wood gun cabinet include a mirror back, glass doors for enhanced viewing, can lighting, and high quality secure locks on all doors for safety. The door knobs are black painted solid wood. The detailed rope molding helps to give a beautiful touch of brilliant craftsmanship to this beautiful gun cabinet. Also includes an adjustable wood shelf in the bottom and three dovetailed drawers with full extension drawer slides that are Touchsystem activated - an impressive feature that demonstrates superior functionality and durability. This beautiful gun cabinet is Amish made in your choice of Oak (Standard), Cherry, Quarter Sawn White Oak, Hickory, Maple, or Brown Maple Woods. We offer a wide range of finish options and will send you free stain samples in the mail upon your order to ensure that you get exactly the stain you are looking for. Because our solid wood gun cabinets are made by the Amish, they are also made in America! Its time to select a gun display cabinet as special as the treasured guns themselves! 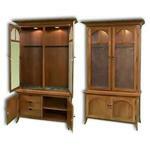 If you have any questions on this gun cabinet or other Amish furniture that we offer at DutchCrafters, give us a call. Our friendly and helpful furniture specialists are happy to help in any way that they can!